visualise | Is life worth living? I often use scatter plot to analyse relationship of 2 valuables. There are a lots of tools for visualise dataset. Now, I challenged to use seaborn. Seaborn is python library based on matplotlib. And easy to make cool visualisation. Following snippet, I read sample data from rdkit install folder and plot MolWt vs LogP using jointplot. Jointplot can show not only relation ship but also distribution of dataset. Also this library is compatible with Pandas. Seaborn seems to young library (most resent version is ver 0.6.) but very useful and cool library I think. Here is sample. 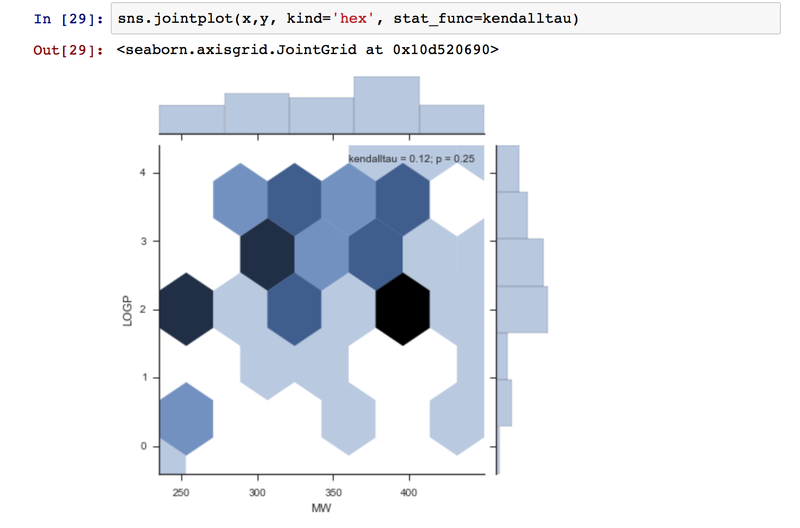 This is jointplot using hexbinplot. I pushed snippet to git-hub.